Sept. 28 was a big day for diabetes tech approvals in the US – a big step in bringing the latest and greatest tech to people with diabetes! 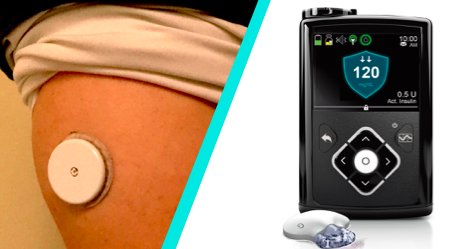 Read on for a deeper dive into both products, from diaTribe’s recent article on upcoming diabetes tech launches, and stay tuned for more on these latest FDA product approvals! What’s New? The FreeStyle Libre Pro has been under FDA review for more than a year and approval is expected very soon. Libre Pro consists of a tiny glucose sensor (less than a quarter-inch long, about the thickness of a hair) worn under the skin for 14 days and connected to a water resistant, on-body patch slightly larger than the size of a quarter. This version is used to help healthcare providers and researchers track an individual’s blood glucose trends over a longer period of time. After applying Libre Pro in the doctor’s office, it is worn for two weeks, during which time the sensor automatically records glucose values every 15 minutes. There is no receiver and the wearer does not have to enter any fingersticks – the system is factory calibrated and collects data in the background. The sensor data can then be downloaded during a visit with a healthcare provider, allowing for discussion of glucose trends and changes in therapy. What’s New? The MiniMed 670G is a hybrid closed loop system that uses glucose data obtained from a continuous glucose monitor (CGM) to adjust basal insulin delivery via pump. The system targets a blood glucose level of 120 mg/dl and will use an updated Enlite 3 sensor that is much more accurate. While it is not fully automated or hands-off – it still requires carb counting, manual bolus corrections, infusion set changes, sensor wear, and calibrations, etc. – it has already been shown to reduce burden while resulting in much less hypoglycemia (low blood glucose) and hyperglycemia (high blood glucose), especially overnight. In a study, most participants on the 670G system reported waking up around 120 mg/dl every morning with no overnight lows. Study data additionally showed: users saw a 0.5% decrease in A1c (from a starting level of 7.4%), including a 1% A1c improvement for those starting at over 7.5%. At the same time, users saw a dramatic 44% reduction in time spent in hypoglycemia (low blood glucose), greater time-in-range, and tighter glycemic control (less variation in blood glucose). The results were particularly strong overnight and in adolescents. The 670G will follow on the heels of the just-released 630G, which uses the same pump platform but doesn’t have the hybrid closed loop component (read more here). Both devices bring long-awaited waterproofing, color screens, and remote meter bolusing.